REVO. The exceptional timber building system for a challenging world. Pre-manufacture: Our patented design and timber building system allows us to pre-manufacture every component under controlled conditions, ensuring savings in both time and money. Components are accurately sized, tested and labeled, ready for assembly on site. Our streamlined process allow us to complete the timber house construction of a typical 25m2 to 30m2 unit in as little as 3 days! Ecologically sensitive: T&B Projects are sensitive to the environment which is why our timber is procured from FSC-accredited plantations. The REVO units are also thermally insulated and can be disassembled and re installed elsewhere with near 100% recovery of components – resulting in a significantly lower carbon footprint than traditional methods. Ease-of-erection: A flawless project starts with simplicity, which is why we do all of the design, planning and complex machining ahead of your build. This means that only limited skills, less labour and basic tools are required for installation. 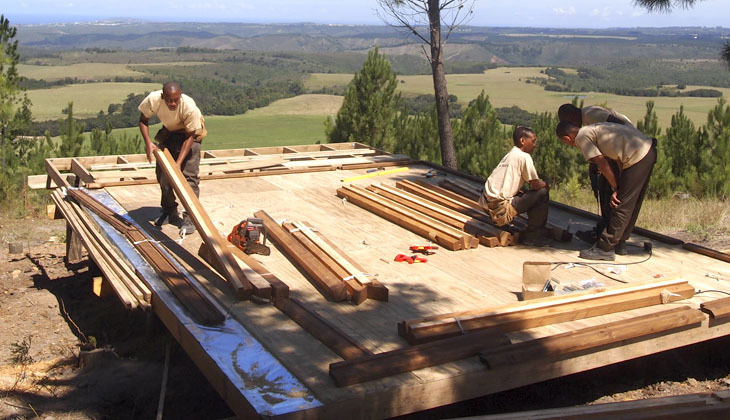 The timber home kits are supplied with a complete set of technical construction drawings, instructions and can easily be installed on a concrete base or elevated timber base. Aesthetically pleasing: There’s no denying the warmth and personality of timber – popular for centuries in overseas markets timber homes can be as pleasant on the eye as they are on your wallet. REVO Homes can be custom-designed to virtually any taste, both internally and externally. And with a wide variety of cladding, finishes and decorative treatments to choose from, REVO Homes offer unsurpassed flexibility in both style and substance. Complete peace-of-mind: Your investment in a REVO home is one that offers peace-of-mind because every component used – whether manufactured, treated or sourced – is meant to last. We supply REVO Homes with pre-glazed aluminum windows and doors, all timber components are treated against fungal and insect attacks and the quality fixings, brackets and fastenings are corrosion-resistant. Of course all of this is backed by the multiple award-winning T&B Group (incorporating T&B Log Homes), the logistics, project management and timber construction company with over 29 years in timber house construction. Copyright © 2017 T&B Projects. All rights reserved. Disclaimer. Website by 2Heads.